This massive amount of seed was needed as part of the expanded workload TWI’s field restoration crew is tackling in the third full year of a huge seven-year restoration effort. At 1,900-plus total acres, it’s also the largest single project we’ve undertaken at Midewin. Once complete, the vast landscape of restored prairies and wetlands will link with other previously restored areas scattered across Midewin’s west side, providing even more benefits for rare plants, birds, and wildlife. TWI Midewin Project Manager Trevor Edmonson watches as bags of native seed are unloaded off a truck. In all, TWI planted 9,817 pounds of seed across 574 acres. Photo by Donald Gross/TWI. Obtaining that sheer volume of seed wasn’t easy. TWI Ecologist Anna Braum spent much of the past year working with growers across Illinois to find and order the amounts needed of each species. The vendors themselves needed to build up their capacity months in advance to fulfill TWI’s requirements! Once Anna’s task was done, the orders started arriving in December by the literal truckload. The seed planted was comprised of forbs (broad-leaved flowering plants), grasses, sedges, and even a few pounds of shrub seed. The largest amount planted was of little bluestem—4,500 pounds for that species alone. Little bluestem is known as a matrix species for tallgrass prairie; once it establishes, many other native species coexist with it while non-natives are kept out. However, TWI also planted smaller amounts of seed of rarer species like wood betony, blue-eyed grass, and false toadflax. Sowing seed for large restorations takes more than just scattering it out on the ground. Following delivery, TWI’s field restoration crew worked with Forest Service staff on a multi-step process to prepare the seed for planting. 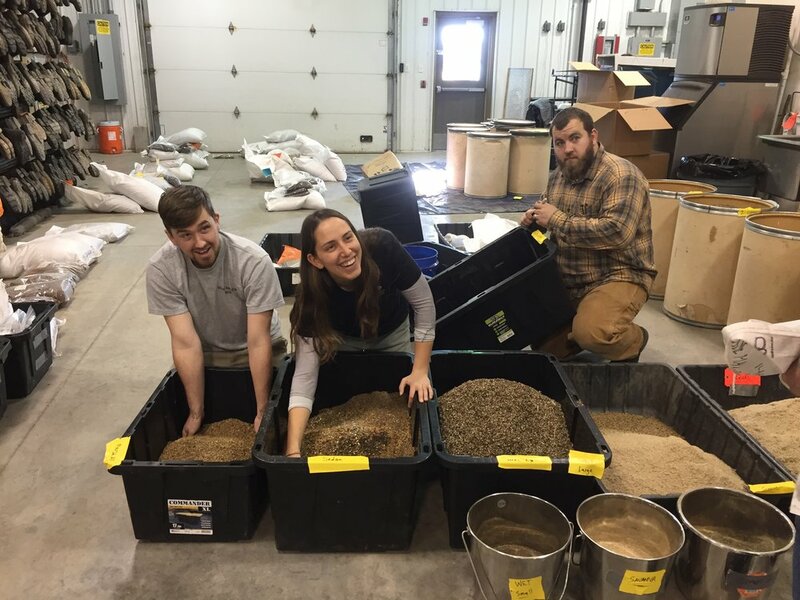 TWI field restoration crew members mix seed by hand in Midewin’s horticulture building. Photo by Phoebe Thatcher/TWI. First, they cleaned and mixed together the seed of each species obtained from multiple vendors. Then they created multi-species seed mixes appropriate for each of seven different habitat types to be restored, ranging from marsh to gravel prairie, based on those species’ preferences. Finally, TWI used a contractor to spread each of the seed mixes over the projected habitat areas with heavy equipment. TWI also seeded certain rare and conservative species by hand in clusters or “hotspots” and marked them with GPS so their populations can be tracked and amplified over the years to come. Most of the new 574 acres had been planted with soybeans for two years previously. Though it seems counterintuitive, planting a degraded field with a soybean crop for one or two years is a very effective first step to prepare the area for restoration. Once the beans are harvested, the crop leaves a blank slate free of weedy species and ideal for reintroducing native wildflowers and grasses. After the seed is spread over the bare ground, the natural freezing and thawing cycles over the winter work it into the soil and aid in germination. Other new acres are being planted where earth-moving work has been done to remove concrete ammunition bunkers and other infrastructure from the site’s arsenal days. To date, the Forest Service has removed 67 bunkers in and near the seven-year restoration area—an undertaking that is unprecedented in scope as well. A map of the seven-year restoration area (in bright green) showing new planting areas for 2019 (cross-hatch) and ammunition bunkers that the Forest Service has removed (yellow dots). Map by Jim Monchak/TWI. As spring moves into summer, TWI’s field restoration crew will supplement the seeding by planting thousands of plugs (seedlings) of native species by hand. Meanwhile, they’ll work hard to control invasive plants, shrubs, and trees to give the developing plant communities the best chance possible. The Forest Service’s cadre of dedicated Midewin volunteers and the National Forest Foundation’s Midewin Youth Corps of urban high school students will augment their efforts on both fronts. What will it look like years from now, once all these newly seeded areas have been fully restored? The seven-year project area will not be open to the public while restoration is underway, but visitors can explore restored prairies and wetlands elsewhere at Midewin (and catch a glimpse of its reintroduced bison herd) year-round. Visit the Forest Service website to discover hiking trails, and learn about the many ways you can volunteer at Midewin here.